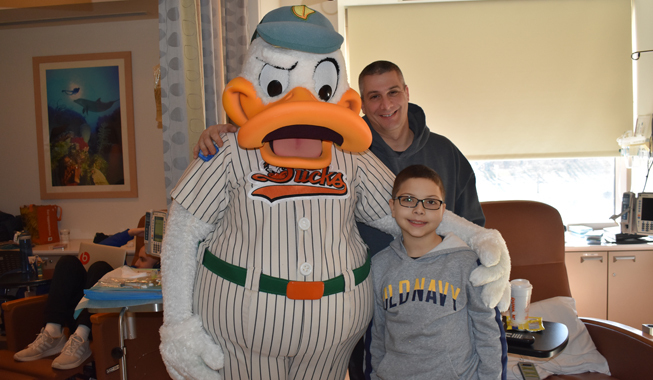 (Stony Brook, N.Y., Jan. 30, 2019) - On Wednesday, QuackerJack traveled to visit his friends at the Stony Brook Cancer Center, on behalf of the Anne V. Graziani Fund. Long Island's favorite mascot lit up the hospital floor as he made his way through, visiting both adults and children. QuackerJack gave out some OYO Minifigures of himself for the kids in the Cancer Center to play with. Faces filled with joy as QuackerJack stopped to take pictures with everyone, including many of the staff members. Many of them told QJ about their love for baseball and how much they appreciated him stopping by. QuackerJack enjoyed getting to hang out with his friends and put a smile on everyone's face!